FIRST: Naoki Urasawa's 20th Century Boys is better than I could possibly communicate to you. It's a stunningly rendered, painstakingly told story about despair, ambition, and the ways we both fall short of and transcend the hopes of our childhood selves. It's first rate comics, and an incredible story. If you're ever going to read Manga, read 20th Century Boys. 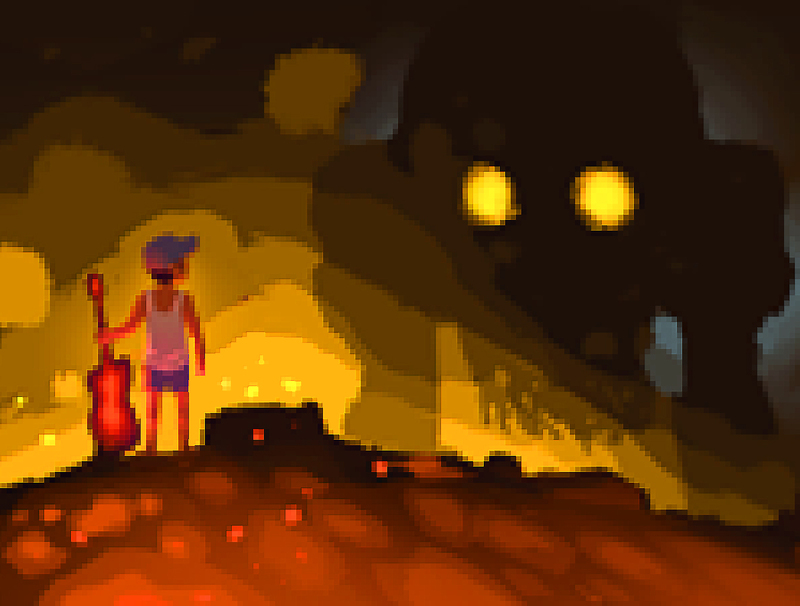 Below is Kenji, the series protagonist, facing off against his nemesis. But as a child. With a guitar. Just read the comic, it's incredible. SECOND. I recently played through Studio Pixel's Cave Story, (which is wickedly fun) and had to do something pixel-y. It took me a while to figure out how I wanted to do it, as I have a friend who's doing some truly unbelievable things with a lo-res look at the moment, and I didn't want to infringe on his territory. But I feel like I found something adequately removed. Anyway, that's why everything's all pixel-fied. Cave Story is such an important game. This is cool, by the way. Was it drawn with pixels, or pixelated afterwards? Yup, both stories are super great. Go pixels. Go manga. Go world. If there was only one reason to read manga, it would be Urasawa. And Cave Story is easily in my top ten best games ever. Have you finished it? I really like the colors in your piece -- it sells the hot glow. Sam: It was pixelated afterwards. 'Cause I'm lazy. Brant: I did finish it, and I LOVED IT.